I'm getting ready for a weekend of camping and floating down the American River with about 40 teenagers, so we haven't been doing nearly enough fun things this week (just lots of errands). Fortunately my creative son keeps us going with some of his inventions. Today's activity was all him and he was so excited when I wanted to take pictures of him doing it to share with you! All you need are some crayons, a flat surface, and your imagination. There are a gazillion children's books that teach about shapes, so it is fun to read one of those first to review the different shapes that you could be making. After my son made each crayon creation the toddler had to get in on the action and swat at them and knock them out of place. At first my son was really annoyed by what she was doing (so that gave us a good opportunity for us to chat and him to teach her to ask first)... but after she got started, he thought it was fun to knock them around too. Pretty soon we had crayons rolling all over the kitchen. This activity was so simple and easy but a great one for reviewing (or teaching) about shapes!! 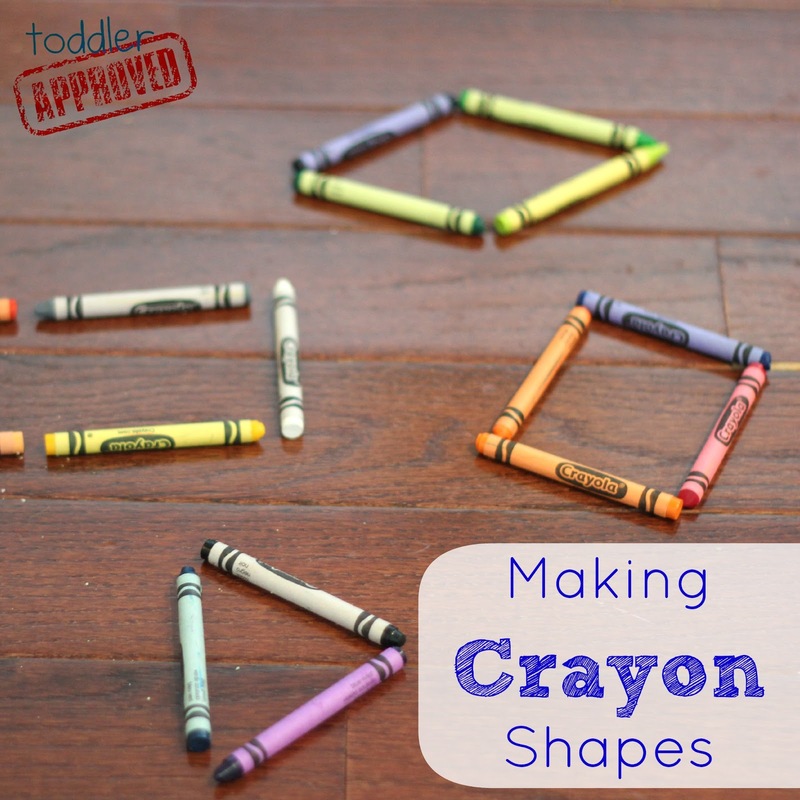 Do you have any other favorite simple shape activities or crafts? I loved this stretchy band shapes activity over at I Can Teach My Child yesterday. PS- Did you fill out our Summer Reader survey yet? The deadline is tomorrow! Go here to do it and enter our special reader giveaway just for participants. The giveaway winner will get three of our favorite Fall picture books! PPS- Our Kevin Henkes giveaway week is in session! Don't miss out! We are giving away a copy of Chester's Way. Don't forget to enter! Disclosure: This blog post contains Amazon Affiliate links.